November has been quite a month for Southport - and voting for the Trust in Yellow Player of the Month is now open. Through to the FA Cup second round for the first time in 12 years by beating Football League opposition in Dagenham & Redbridge, November has seen Southport continue their excellent form under the management of Gary Brabin. With four goals in as many starts, including a crucial strike against Dagenham, John Marsden is the leading scorer this month, while Joe Connor, Danny Hattersley, Richard Brodie and Amadou Bakayoko have also found the target. In goal, David Raya Martin has gone from strength to strength with a series of highly assured performances and October’s winner, Paul Rutherford, has once again been in sparkling form, creating two goals in the win at Nuneaton Town, including one which saw him run half the length of the pitch. Or has another player caught your eye in November? There are sure to be plenty of contenders this month. Voting is open until 8pm on Friday 5 December and the presentation will be made ahead of the FA Cup second round match against Eastleigh on Sunday 7 December. Find out more about the Trust and their activities by visiting www.trustinyellow.com. Unfortunately there will be no coach running to Nuneaton due to a lack of bookings. Paul Rutherford has been voted the Trust in Yellow Player of the Month for October. In a month that brought a huge improvement for the Southport team under new manager Gary Brabin, Rutherford won a closely-run competition in which many players received nominations. The winger came out on top by a single vote, edging out second-placed Luke Foster and several of his team-mates who were tied third in a well-supported poll. 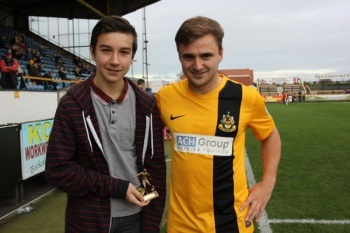 Rutherford was presented with his award by Southport fan Jamie Hanlon ahead of Saturday’s match against Dover Athletic. In many ways, Rutherford has epitomised the Sandgrounders’ revival under Brabin, turning in a series of tireless performances to show arguably his best form since joining from Barrow last summer. Supporters will have the chance to vote for November’s award at the end of the month. Southport's next away game is the FA Cup tie at Dagenham on Saturday 8th November. The coach will depart the Merseyrail Community Stadium at 7.30am. To book phone Alan Scarisbrick on 07980911693. HOWEVER WITH 40 BOOKINGS THE PRICES WILL DROP TO £29 AND £15. These prices reflect the cheapest quote available to the Trust at short notice which was £1275.